I'll be completely honest, when I first saw the pics of the vest I wasn't sure they'd be for me, I'm not a fan of fancy hemlines, you know hanky, asymmetric etc. but when they arrived I'm glad I gave them a chance. The material is really soft, quite heavy weight for a jersey but not so much that they'll make you feel hot. I particularly loved this vibrant almost neon yellow/lime, it just looks really great against the navy. Claire also very kindly sent me some jeggings to wear with the vests and they are so, so comfortable, they have bags of stretch in them but don't go baggy at the knees. I was really taken with them! 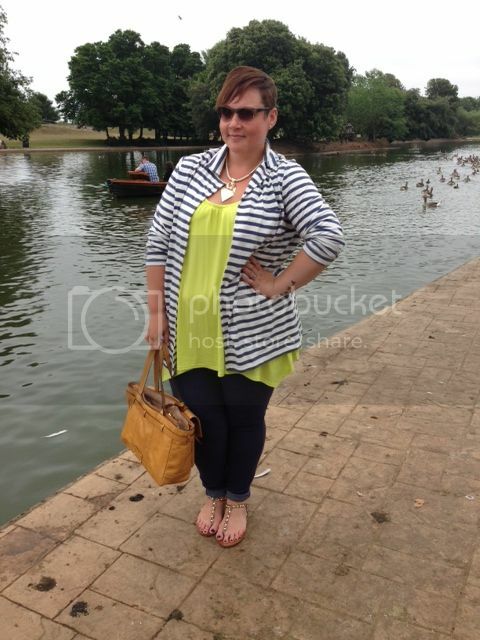 Both the vests and jeggings are a size 22 and have found them all true to size. That said, if you are at the top end or above the 32 that the tops go up to I would say the 32 would easily accommodate a 34 if not a 36 and at just £8.99 they make a really great wardrobe basic. They're quite versatile too as you can see with the navy I tucked it into a maxi skirt and bagged it out for a different look. As always I'm bowled over with excite, not only do they've some really fun pieces, you just can't beat them on price. They have the vests in a floral print at the moment too, I think I might have to treat myself! I have always wanted to be able to pull off this kind of top but, I haven't had any luck with it looking right on me however with saying this, I love both looks on you and the first especially paired withe the striped jacket which makes me want to give it another go. I Love your style and I am so glad that I have found your blog! 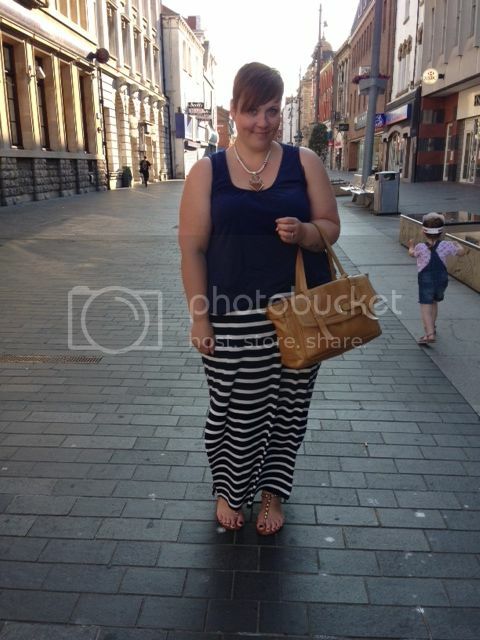 I love the navy stripe maxi skirt, where's this from please? That is such a happy yellow color. So pretty. I don't usually like jeggings but these are actually nice. Bought four of these tops last week, after you posted the photo of the yellow top. Thanks so much for the recommendation. It's been difficult finding tops that are long enough to cover my buddha belly, without drowning me. I find these days tops are either too short or long enough to be dresses.